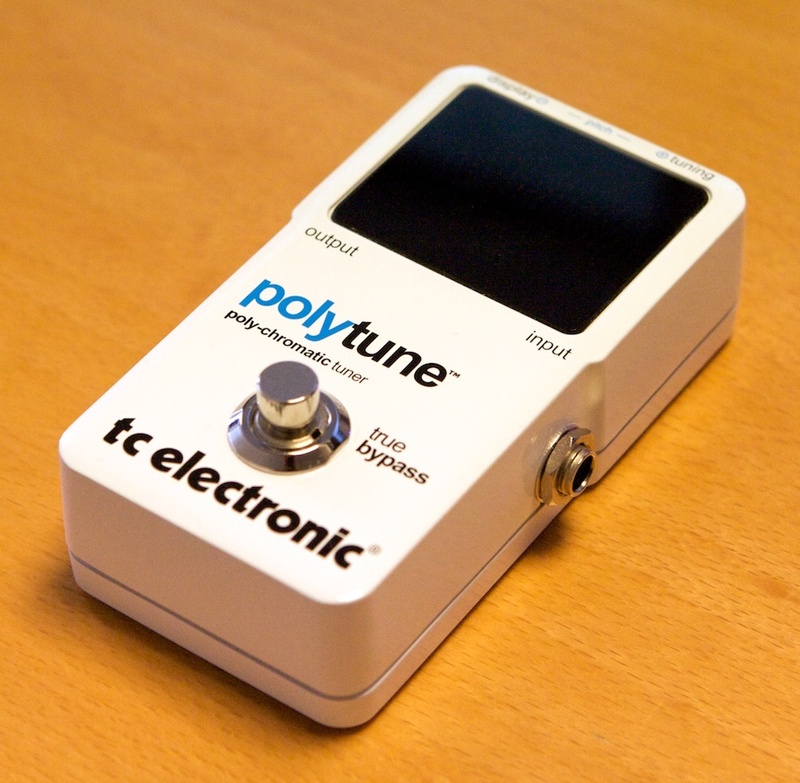 PolyTune - White, Tuner/Pitch Pipe/Tuning Fork from TC Electronic in the Polytune series. In the beginning, there was the tuner. It is pretty easy to use: just strum a string and it will show you if it is is too high or too low; tune the string and repeat the same procedure for the rest of the strings. The stompbox format has been readily adopted by live guitar players because it allows them to easily tune their guitar between songs. In fact, when you are playing live on stage the less you spend time tuning your guitar, the more your show gains in intensity. A gig without good mood is like a cake without the icing! The PolyTune's design is pretty standard: rugged, white aluminum enclosure, display packed with LEDs, a footswitch to activate the tuner and mute the guitar at the same time, and one input and one output on 1/4" jacks. 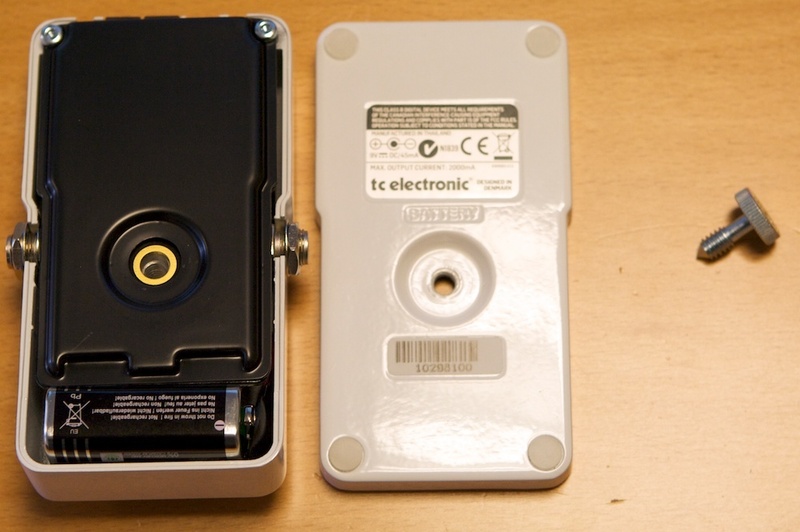 The stompbox has a very sleek look, compact dimensions (2.8" x 4.8" x 1.8") and it weighs only 0.7lb (battery included!). 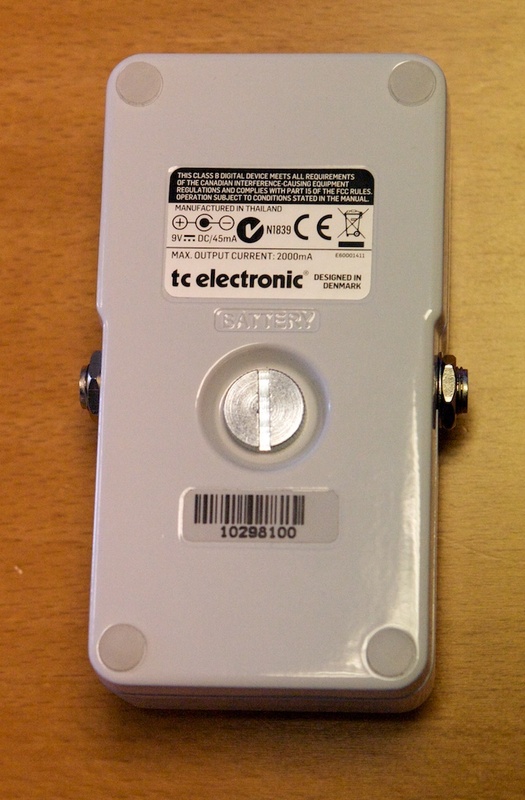 To access the 9V battery, you just have to unscrew the large screw on the bottom side of the stompbox; as simple as that! You may also power the tuner with a 9-volt power supply (sold separately), and the stompbox also features a power output to forward the voltage to additional stompboxes. 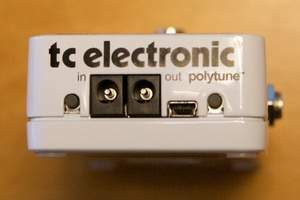 The PolyTune is provided with two tiny Velcro tapes so that you can fix it to your pedal board. Nice! The display features a 109-LED matrix and it is easily readable even in environments with poor lighting (like on stage). Adding to this, the PolyTune is equipped with an ambient light sensor that allows it to match the LEDs intensity to the surroundings. Smart Danish technology! The footswitch clicks nicely under the shoe and will certainly withstand repeated foot assaults. When inactive the pedal is in "true bypass" mode so that it doesn't affect the guitar signal. The stompbox works in two different modes: classic monophonic mode, which allows you to tune the strings one by one, and (the famous) polyphonic mode, to tune all strings at the same time. 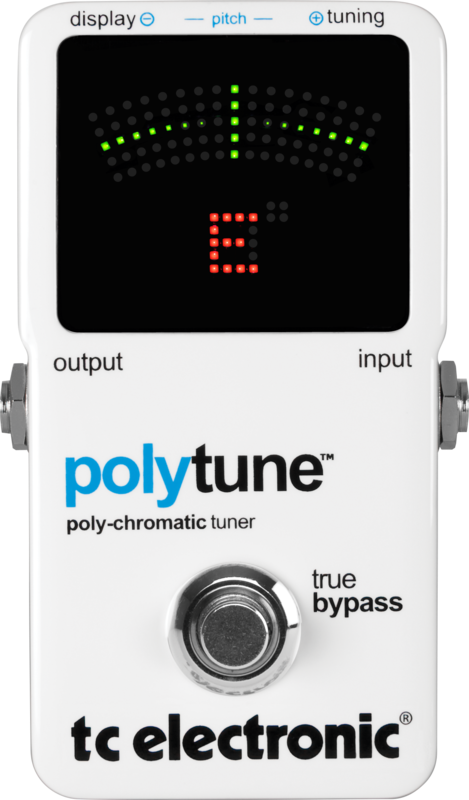 Mode selection is automatic, the PolyTune detects if you play only one string or several strings at a time! The standard chromatic or monophonic mode provides two different display views: the first one shows a needle that must be centered; while the second one shows a sort of caterpillar moving forward (to the right) when the tone is too high, or backward (to the left) when the tone is too low, the goal is to bring the caterpillar to a standstill. The name of the note you play is indicated on the bottom of the screen. There's a button on the rear panel to select one of the two display modes, as well as the instrument mode: guitar or 4, 5 or 6-string bass guitar. To facilitate tuning, the needle and the caterpillar are slightly slowed down when they are close to the right pitch. The polyphonic mode is also very simple to understand: each string is represented by a pair of green LEDs on the center of the screen when the string is in tune, or red LEDs above or below the center of the screen when the string is too high or too low. You can see right away which strings are out of tune and tune them properly. The operation is the same with 4, 5 or 6-string bass guitars. Musicians who use drop tunings have the possibility to drop down the tuning up to five semitones. On the other hand, it is impossible to use the polyphonic mode for open tunings. A last remark about this mode: TC Electronic recommends you to strum the strings with your thumb and to use the bridge pickup. According to them, the chromatic tuner has a precision of up to 0.5 cent. Last but not least, you have the possibility to adjust the reference tone which is set to 440 Hz by default. You can calibrate the tuner from 435 Hz to 445 Hz in case you play with musicians using a reference tone other than 440 Hz. To activate the calibration mode, just push the two rear panel buttons simultaneously. Your setting will be stored even after you turn off the device. 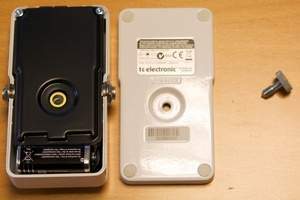 And there's also that mysterious USB connector on the rear panel... Could we expect an update from TC Electronic in the future? 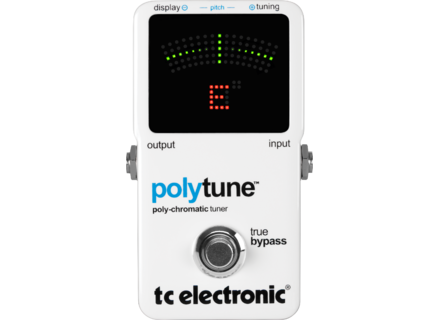 TC Electronic incredibly managed to launch a totally new product in the tuner pedal market, which is quite a feat. The polyphonic mode displaying all six strings at once saves guitar players lots of time on stage. The manufacturing quality is impeccable and the product is packed with clever ideas like the auto adjustment of LED intensity, the power output and the dual needle/caterpillar display in monophonic mode. One thing is for sure: all competitors suddenly look a lot older and the PolyTune offers much more for the same price (about $100).